This Easy French Toast recipe with a spicy twist makes your mornings worth waking up to. It is crispy on the outside and soft on the inside. Perfect with both savory and sweet toppings but I love it as it is. This post was originally published in 2009 and we’re updating it with new pictures and additional information. You might have seen thousands of french toast recipes around the Internet. 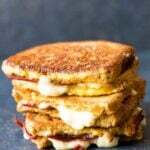 Savory, sweet, stove-top fried, oven-baked, french toast sandwiches or served in sticks. I wasn’t aware that there are that many variations in other cuisines until I started blogging and learning from others. However, today I want to go simple and share mom’s easy french toast recipe which we grew up with. If you are one of those who can not think of breakfast without bread, you have something in common with Turkish people. We LOVE to spread something on bread such as butter, honey, cluttered cream, strawberry jam or even a spicy pepper paste. Breakfast is like a big ceremony with lots of foods at the weekend when all family members are together. It is a BIG reason to wake up! Although I love to go with quick and easy breakfast recipes especially during weekdays like Warm Bulgur Breakfast Bowls, Overnight Coconut Oatmeal , Banana Oatmeal Breakfast Cookies or Low-Carb Egg Muffins for a grab-and-go breakfast, weekend breakfasts are always my favorite. Nobody can refuse newly made french toasts for breakfast. We make it in the simplest form: Beat eggs, season with salt and spices. Dip bread slices into beaten egg mixture so that they absorb the mixture well and then fry. No additional flavors. Since my mom loves to add spices on almost everything, she sprinkles some into beaten eggs when making her easy french toast recipe. This recipe doesn’t have any milk. The mixture contains just eggs and spices, which makes the toasts fluffier. What’s more, we use olive oil for frying the toasts, so it’s great for those who are allergic to dairy products. If you don’t like the flavor of olive oil, use another plant based oil like sunflower oil or coconut oil. How many recipes can you make using french toasts? 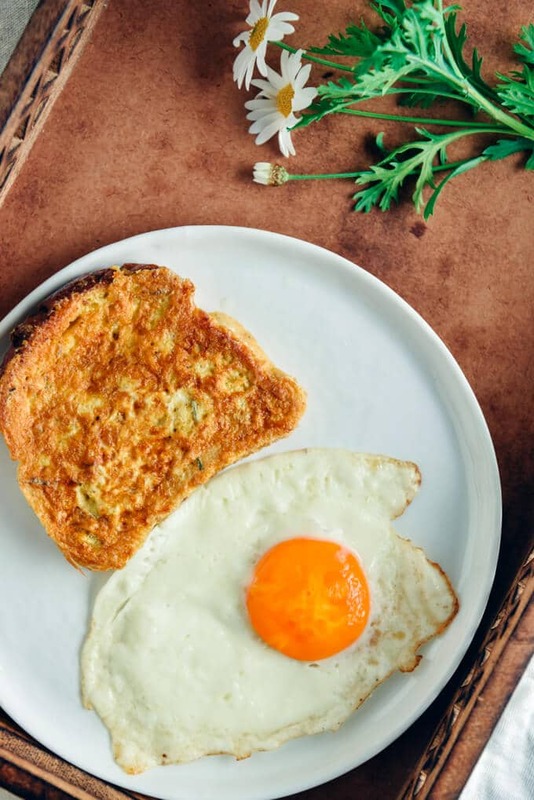 I’m always amazed when I see how creative fellow bloggers can be about preparing breakfast recipes. Have you ever tried breakfast kebabs? No? I’m sure French Toast Sausage Breakfast Kebabs would disappear in a minute if there aren’t any vegetarians in your family. Can you imagine banana bread in the form of french toasts? Wouldn’t it be fantastic for breakfast? I need to try IHOP Banana Bread French Toast recipe asap! Serve them hot with typical Turkish breakfast foods like cheese, olives, sliced tomatoes and cucumbers. A glass of Turkish tea or coffee must accompany as well. French toast with a spicy twist. So easy to make. Break the eggs in a medium bowl. Add in spices and beat well. Dip the bread slices into the mixture. Make sure boths sides absorb it. Heat 1 tablespoon olive oil in a skillet and cook 2 slices at a time for about a minute per side or until golden. Repeat for the other two bread slices. I’m with you. I can’t stand it when people add flavor to my french toast! Hi Natalie! I’ve already missed the weekend! 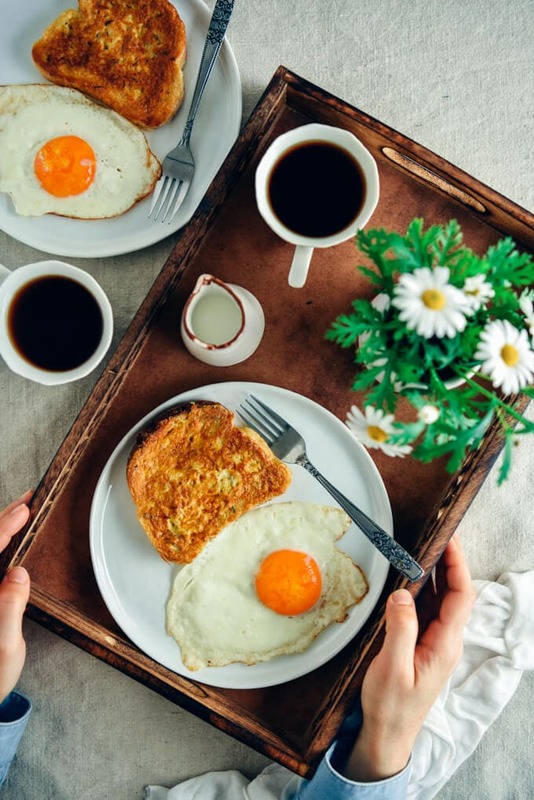 Cozy breakfast is the reason for happiness in life! I haven’t heard of savory French toast, here I think most everyone eats it with maple syrup. I like the idea of making it a savory dish! Thanks for the shout-out for my egg muffins. I love to pair it with cheese. Hope you have a chance to try it. Your egg muffins are great for weekdays! I can eat this every morning. French toast never gets old. Glad you like it Carol! French toast is a must for a good breakfast, isn’t it?